First Production run of The “Golf Mahal” to be available in February! So, I know a lot of you have been waiting a while to get your hands on the bag, but I have finalized the design and bags will be going into production by the beginning of January. I thought we would be able to expedite this process and get the bags out sooner, but we are just so busy right now that this is not feasible. I apologize to those whom I told the bag would be available sooner, but I assure you that the wait will be well worth it! We are a small homegrown company that builds the most durable gear on the market, and because of this our bags are immensely labor intensive. We have the highest quality standards fo backpacks on the market today both in our construction and inspection of our bags, and are privileged enough to employ Montanans to do so. Designing the Golf Mahal is only a part of what I do here at the Mystery Ranch as most of my prior experience lies in pre-production, inspection, and finishing of products. 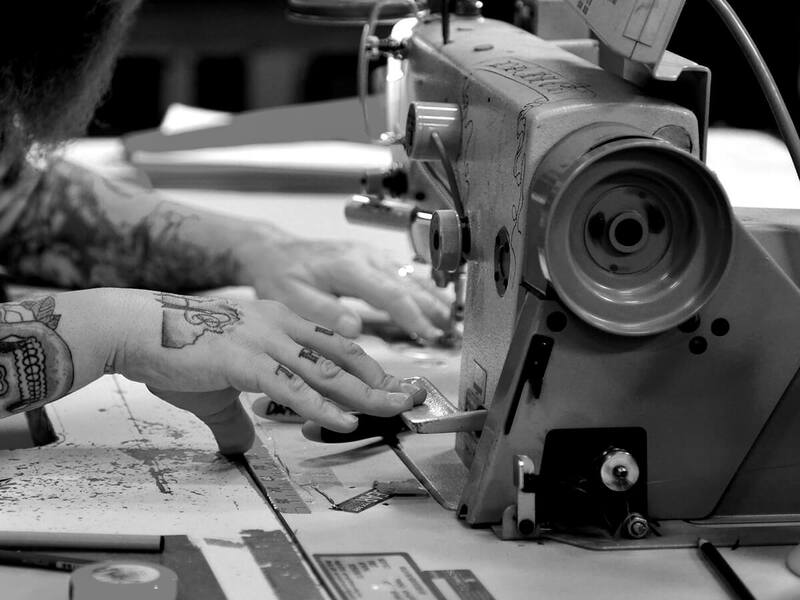 I now also train new employees how to sew and use the other various machines we utilize. It is through a combination of this experience, as well as over ten years of playing disc golf, that the Golf Mahal was able to come to fruition. 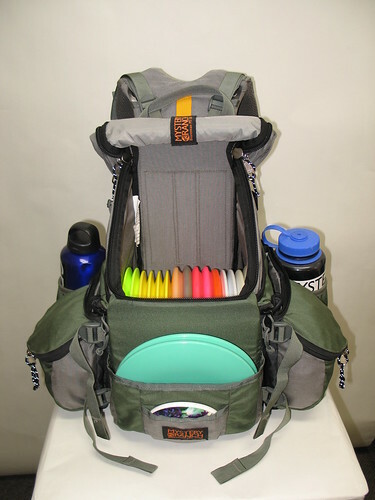 Here is an update on the newly added features, color availability, and general look of the bag you will hopefully soon own. Hope you dig it. As you can see, the basic design is quite similar to the original, but there are some new tricks as well as some revamped aspects. 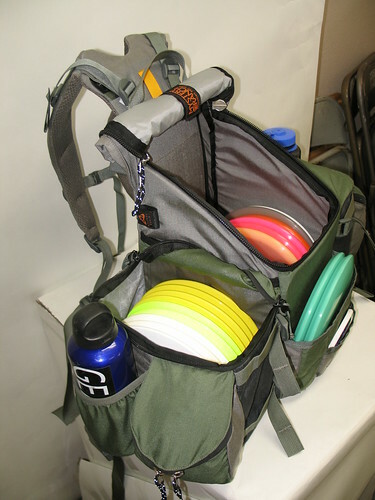 As far as outright changes, the bag has been downsized a touch from its original behemoth status, though still retains an ample amount of storage. It should be noted that the small outermost side pockets are only slightly different from the originals, and are subject to change only slightly from those pictured. Regardless, they will excel at holding cell phones, keys, snacks and the like and will be outfitted with waterproof zipper as seen here. 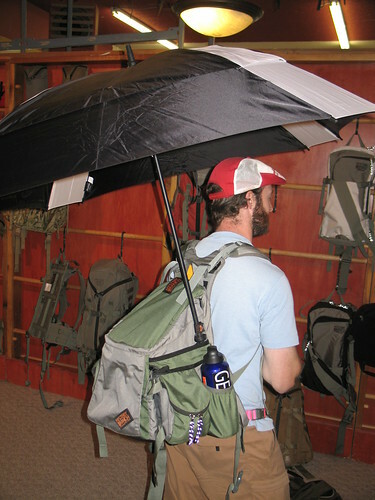 The umbrella slot on the side has been improved so as to sit higher over the head while wearing the bag with a deployed umbrella. I am about 5’9″ and have over a foot of space over my head, so unless you’re over 6’9″ I think you’ll fit comfortably underneath any standard large sized umbrella. 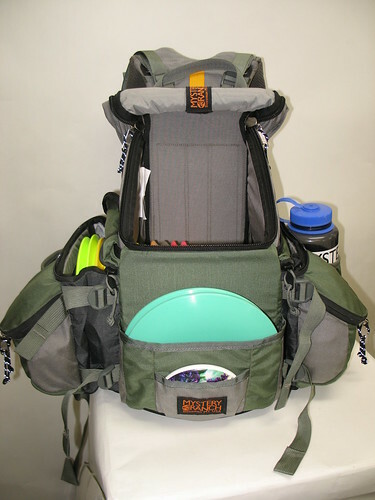 Furthermore, the lid and putter rain fly (aka Darth Vader Mask) now roll up and Velcro closed at the top of the main opening of the bag as promised, and now cups front of the bag eliminating the need for the buckle at the bottom. With the amount of pockets and shear storage space on the bag, as well as the desire to keep the price of the bag down, I have also eliminated the score card pocket promised in the previous article. I seriously doubt you will notice. I’ve included pictures of the finalized model so that you can see how the large side compartments compress , immensely slimming down the width of the bag. Note that these contain waterproof zippers and you can compress these compartments all the way down or only partially, allowing for a variety of different size combinations. 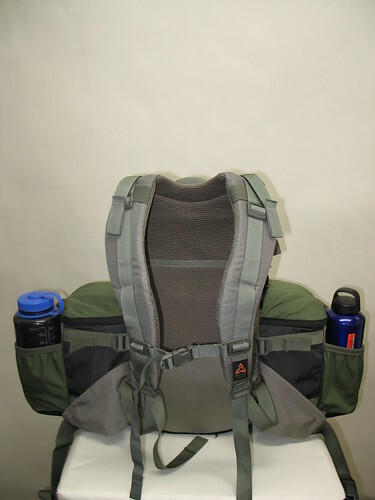 The bag will initially come in 2 different colors: the green and grey as pictured here and a multi-cam camouflage pattern (note this camouflage pattern is pictured on other packs on the website). Color combinations will change periodically and will most likely include a digital camouflage as well as some brighter colors in the future. 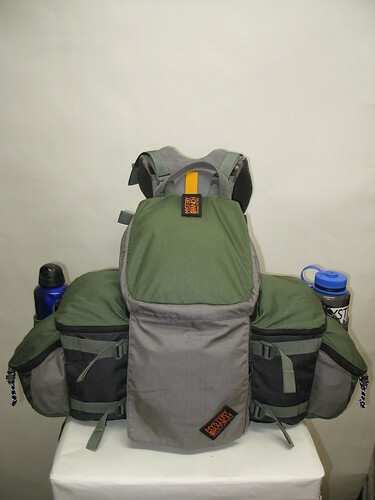 The price will be right around $285, and like all the rest of our packs will include a lifetime warranty. 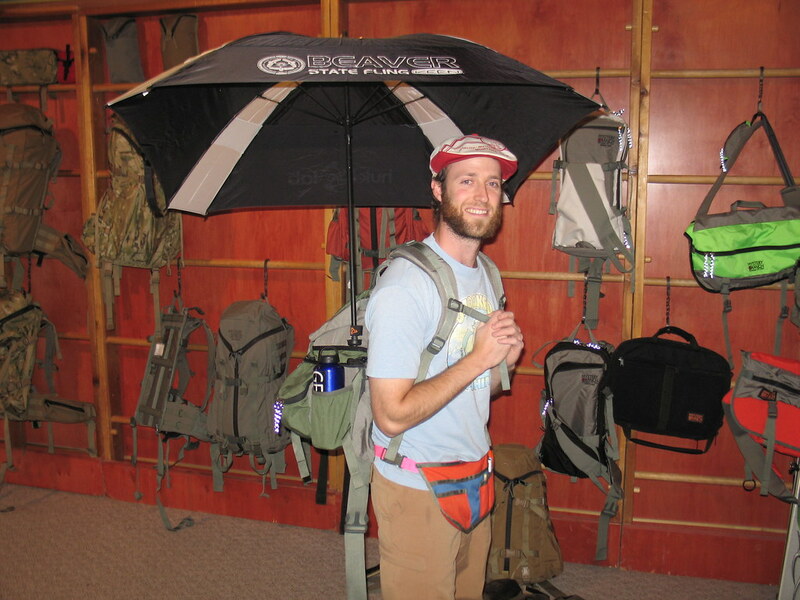 I will try to keep the blog as up to date as possible, and if you have any specific questions you can email me at levibuckingham@mysteryranch.com. Thanks for the continued interest and patience – I can’t wait to get you rocking the Golf Mahal!